A new version of the 15-inch MacBook Pro running a Haswell chip from Intel has shown up in the results on Geekbench. An update to the MacBook Pro line of laptops is expected to arrive at any time now. Some speculation existed that we would see them unveiled at WWDC in June, but now that the event has passed us by, it could really be at any moment. It does appear that the new version of the 15-inch MacBook Pro is in active development as MacRumors has discovered the laptop being tested on Geekbench. 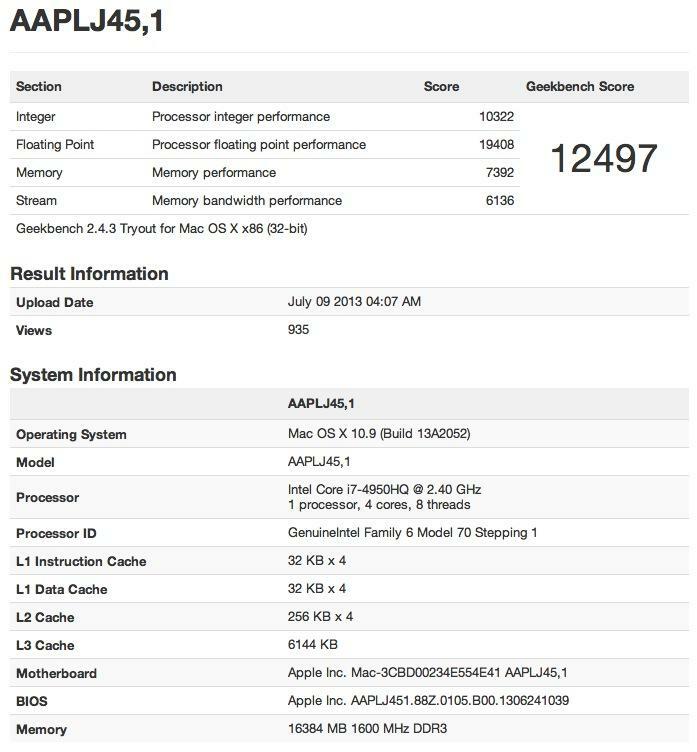 The new test shows a MacBook Pro running an Intel 2.4GHz Core i7-4950HQ processor which is part of the new Haswell line that Apple used in the recent refresh of the MacBook Air line. The laptop in question was also sporting 16GB of RAM and a new build of OS X Mavericks, the latter of which definitely adds to the feeling that this is the next iteration of the product line. What’s missing here is any indication if this is a Retina display model, but as that appears to be the direction Apple is heading with its Pro line, it more than likely is. We also have no indication of the battery life which is where the Haswell chips really excel, and seeing as the Airs got a major battery life boost, our suspicion is the Pros will as well. We’ll have more on the new MacBook Pros as its announced.